When it comes to eating in outer space, taste usually takes a back seat to practicality. This has led astronauts to dine on some pretty funky dishes over the years, including thermostabilized yams, over-steeped tea, and borscht from a tube. 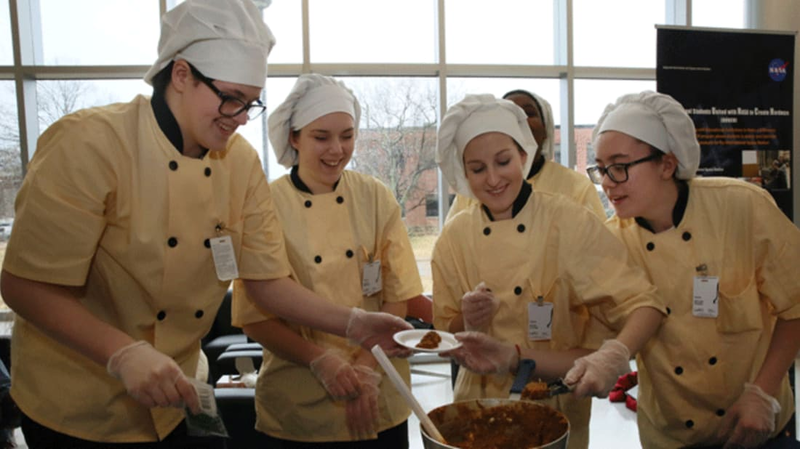 With their second annual HUNCH cooking competition, NASA is now hoping to aim their sights a little higher while teaching high school students a thing or two about food science along the way. Launched in 2015, HUNCH (High schools United with NASA to Create Hardware) gives high school culinary teams from across the country the opportunity to compete to have their dish served on the International Space Station. This year, 30 teams are vying for the top honor. Of those teams, 10 finalists will be chosen to visit NASA’s Johnson Space Center Food Lab in April to prepare their entrees one last time for a panel of judges, including astronauts. The winning dish will be processed and delivered to the crew aboard the ISS. The winning dish at last year’s HUNCH competition was rice and beans with coconut milk from Phoebus High School. A space-friendly version of their recipe will be sent to astronauts aboard the International Space Station in March.